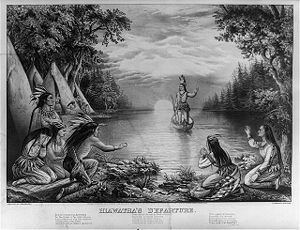 "Hiawatha's Departure" Lithograph by Currier & Ives, 1865. Hiawatha (also known as Hienwentha, Ayonwatha (He Who Combs), Aiionwatha, or A-yo-went-ha) is believed to have lived circa 1525 to 1575. Recent archaeological evidence points to a much earlier date of the union of the five tribes than the fifteenth century, thus dating Hiawatha's life to an earlier time, perhaps by 500 years. A member of the Mohawk Nation, he was instrumental in founding the Iroquois Confederacy alongside the Prophet Deganawida, The Great Peacemaker, and creating for them a constitution known as the "Great Law of Peace" (Gayanashagowa). Many believe that the powerful constitution drawn by the Founding Fathers of the United States may well have been influenced by the Great Law of Peace of the Iroquois Nation. A skilled and charismatic orator, Hiawatha was instrumental in persuading the Iroquois peoples, the Seneca, Onondaga, Oneida, Cayuga, and Mohawk, to accept The Great Peacemaker's vision and band together to become the Five Nations of the Iroquois Confederacy. This powerful group, centered upon the laws of peace, rapidly became one of the strongest forces in seventeenth and eighteenth century northeastern North America. (In the eighteenth century, the Tuscarora nation joined the Iroquois Confederacy following their defeat by British forces, and the confederacy became the Six Nations). Key to the story of Hiawatha is the lesson of forgiveness. Each of his daughters had been brutally murdered by his mortal enemy. It was during his period of inconsolable grief that he met his spiritual teacher and began the process of healing and forgiveness, thus enabling him to again take his place as chief of his tribe. Had he been unable to forgive his enemy, he would not have been able to unite the tribes, bring peace among them and draft a constitution whose principles endure. Built upon the quality of forgiveness, the legacy and legend of Hiawatha endures nearly a millennium after the end of his life. Little is known of Hiawatha prior to his becoming a chief. According to some traditions, he had another name before meeting The Great Peacemaker, who gave him the name Hiawatha. The exact years of Hiawatha's life are not known, though the most accepted years are those of the early to mid-sixteenth century, but there is no written record of him until the seventeenth century. However, this is not unusual since Native American history was passed down orally. The Mohawk chief, Joseph Brant, wrote Hiawatha's biography in the early 1800s, as he had learned it from oral tradition. A more complete biography was written in 1885 by a man named Seth Newhouse. This is the version that is generally accepted by the Mohawk people. What is known for certain is that Hiawatha, along with The Great Peacemaker-Deganawida, built the Iroquois Confederacy, establishing peace among the five tribes and forming what many credit as the model for later American political planning. Recent archaeological evidence points to a much earlier date of the union of the five tribes than the fifteenth century, thus dating Hiawatha's life to an earlier time. According to records of the Confederacy leadership and astronomical dating related to the lunar eclipse that coincided with the founding of the Confederacy, recent estimates date the confederacy's founding and its constitution to between the years of 1090 and 1150. It is said that Hiawatha was a prosperous chief with seven beautiful daughters. An enemy of Hiawatha named Atotarho, killed the daughters one by one as they refused his advancements. Grieving over the loss of his daughters, Hiawatha retreated to the forest. While in exile he met the prophet Deganawida, most properly referred to as The Great Peacemaker. The Great Peacemaker had been expelled from the Hurons, the tribe of his birth, due to his pacifist beliefs. Hiawatha was the first chief to accept the vision of his new teacher. Hiawatha brought Deganawida's philosophy to the five nations; Seneca, Onondaga, Oneida, Cayuga and Mohawk. These tribes banded together and formed a confederacy. It is told that The Great Peacemaker (much like Moses before him) had a speech impediment. Hiawatha's charisma and great skills of oratory were the means of conveyance that the prophet needed. 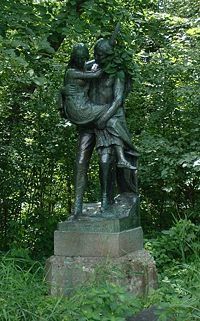 At the time of their meeting, Hiawatha was unable to function as a leader to his people due to his inconsolable grief. He was healed through spiritual ceremony taught to him by the prophet. Thus they empowered each other, and their partnership seemed predestined for the benefit of the Iroquois peoples. The rituals that Deganawida passed on to Hiawatha for his healing continue to be used by the Iroquois today. They are the sequential use of the wampum, the condolence ceremony, and what is known as the re-quickening ceremony. The wampum is a string or belt made of white whelk-shell beads and black or purple sewant beads. The wampum is used for ceremonies, to record agreements, or for gifts or tributes. They are a tool used to remind one of the importance of promises or relationships. The white shell beads of the whelk symbolized internal energies of peace, harmony, and contentment. The condolence ceremony was crucial in the process of peacemaking. Prior to this concept being taught to them, the Iroquois had been warring nations, seeking retaliation for injustice. In Hiawatha's case, ritually mourning his daughters (with the assistance of the wampum belt) helped him to overcome his grief and his desire for revenge. The re-quickening ceremony is the ritual of adopting a member of another tribe as the re-embodiment of one's loss. This provided a sense of balance. Flag of the Iroquois Confederacy, patterned after the original wampum belt used to solidify the formation of the confederacy. The formation of the Iroquois Confederacy was Hiawatha's legacy. The five nations of the Seneca, Cayuga, Onandaga, Oneida and Mohawk (from west to east ) became a group of united democratic communities with a common constitution. The central nation, the Onandaga, had the final voice. Each tribe operated independently, yet a relationship of peace had been formed. The central nation of Onandaga was not a governing body, but served more of a spiritual leadership role. The Gayanashagowa or the Great Law of Peace is the oral constitution created to serve the Confederacy. It ended the ancient cycle of enmity and continuous conflict between the separate tribes. The formation of the confederacy centered upon its constitutional laws brought peace among the group which once warred with one another. Once this group ceased their in-fighting they rapidly became one of the strongest forces in seventeenth and eighteenth century northeastern North America. The Confederacy was democratic in many of its principles. Power flowed up from the small local units, hereditary chiefs were nominated by clan matrons and elected by villages, and all member groups were given a representative voice. The traditions established at the time of the Confederacy's formation continue to be honored by the Iroquois into the twenty-first century. When a new leader is selected to head the chiefs of the Grand Council he takes the name Tadadaho, and the chief who takes the position of Keeper of the Wampum assumes the name Hiawatha. Observance of this tradition reminds members of the Confederacy of its origins and its founding purpose. The original wampum record of the confederacy—a central pine tree with two squares on either side—represents the union of the five nations. Today's flag of the Iroquois Confederacy is patterned after this original wampum belt. The Hiawatha Wampum Belt is a visual record of the creation of the Iroquois Confederacy. This belt is comprised of 6,574 wampum beads—38 rows by 173 rows and has 892 white and 5682 purple beads. The purple represents the sky or universe that surrounds us, and the white represents purity and Good Mind (good thoughts, forgiveness, and understanding). At the center of the Hiawatha Belt is the Confederacy's symbol, the "Great White Pine," also known as the "Tree of Peace." The center figure also represents the Onondaga Nation where the central council fires reside—all issues involving the entire Confederacy are debated and decided there. The other Haudenosaunee nations are visualized as squares: on the outer edges are the Mohawks, guardians of the Eastern Door; and the Seneca, Keepers of the Western Door. The Oneida and Cayuga are depicted in the two inner squares (the Tuscarora, the sixth nation in the Confederacy, joined after this Wampum was created). The white open squares are connected by a white band that has no beginning or end, representing all time now and forever. The band, however, does not cross through the center of each nation, meaning that each nation is supported and unified by a common bond and that each is separate in its own identity and domain. The open center also signifies the idea of a fort protected on all sides, but open in the center, symbolizing an open heart and mind within. Hiawatha was a Mohawk chief who came to symbolize the whole concept of peace and unity. Though the details of his life are not known with absolute certainty, his name and legend have survived for hundreds of years. This gives testimony to the importance and significance of his place in history, beyond his effect on his own tribe. There are towns, counties, schools, parks and streets named for him throughout the United States. In addition, there is the Hiawatha National Forest in the Upper Peninsula of Michigan. It covers 880,000 acres (3,600 km²) and contains six designated wilderness areas. The forest has over 100 miles (160 km) of shoreline on Lake Superior, Lake Michigan and Lake Huron. ↑ Charles C. Mann, 1491: New Revelations of the Americas Before Columbus (New York: Alfred A. Knopf, 2005). ↑ 2.0 2.1 Harvey Markowitz and Carole A. Barrett, American Indian biographies, Magill's choice (Pasadena, Calif: Salem Press, 2005), 213. ↑ Rhodes Educational Publications Hiawatha Retrieved May 23, 2008. ↑ Biographies, Answers Corporation, 2006, Hiawatha Retrieved May 24, 2008. ↑ PBS.org Ely Parker 1770-1844 Retrieved May 24, 2008. Porter, C. Fayne. 1964. Our Indian heritage; profiles of 12 great leaders. Philadelphia: Chilton Books. Rhodes Educational Publications. Hiawatha Retrieved May 23, 2008. This page was last modified on 25 May 2008, at 02:02.